Answer ‘YES’ of ‘NO’ to these questions? 1. Do you ever use one form of credit, such as a line of credit or debt-consolidation loan, to make payments on other debt? 2. Have you taken one or more cash advances greater than $500 in the past few months? 3. Do you ever borrow to meet regular expenses, such as food and utility bills? 4. Can you barely make the minimum required payment on bills? 5. Are you so far behind on credit payments that you are being pursued by collection agencies? 6. Are your financial problems impacting your health or relationships? 7. Have you or your spouse recently been laid off or lost your job? 8. Have you recently been through a divorce or expect to go through one soon? 9. Do you spend more than one-third of your take-home pay on housing? 10. Do you spend more than one-quarter of your take-home pay on your total transportation needs (car payment, car insurance, repairs and gas)? 11. Do you owe two month’s salary or more on your credit cards? 12. Are you using one-quarter or more of your take-home income to pay credit card bills and personal loans (excluding mortgage payments)? 13. Are your revolving credit cards charged to the limit? 14. Have you bounced more than one check in the past year? 15. Are you without any savings? 16. Are you behind on house or auto payments? 17. Are your creditors threatening to take your car, house, or other property? 18. Are you behind on your taxes or owe the IRS? 19. Are your creditors threatening to garnish your wages? If you answered YES to any of these question you may want to consider a FREE bankruptcy consultation. Call us at 801-221-9911 to set up your consultation today! 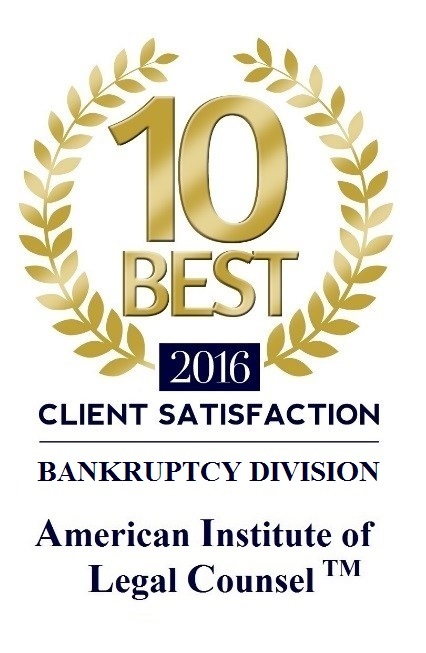 Orem, UT – The Utah Law Firm of Douglas Barrett, LLC was recently named as one of the “10 Best” Bankruptcy Law Attorneys for Client Satisfaction by the American Institute of Legal Counsel (AIOLC) an impartial third party rating service. In the September 2016 announcement the AIOLC noted that the firm was recognized for outstanding client satisfaction. Douglas Barrett opened his bankruptcy practice in Orem in 2001. He is well known for his aggressive representation of consumer debtors in bankruptcy. During the past several years he has helped thousands of people file for bankruptcy protection in the U.S. Bankruptcy Courts. He is a member of the Utah State Bar Association, the National Association of Consumer Bankruptcy Attorneys and has been a frequent speaker on consumer bankruptcy law and personal finance issues throughout the state. A judgment and a lien are not the same thing. A lien is a legal right to get paid from a specific asset/property, as opposed to from an individual person. A judgment is a court order that allows a creditor to pursue collection actions against someone (including creating a lien against assets). Depending on the laws of the state involved, such collection actions can include getting a lien against property, or wage garnishment, or seizures of bank accounts, etc. But as far as discharge in bankruptcy goes, a debt on a judgment is no different than any other debt that doesn’t yet have a judgment–they are dischargeable in bankruptcy unless they meet one of the exceptions set forth in 11 U.S.C. 523. Some people come to see their income tax refunds as a yearly bonus. In reality these refunds are usually caused by a taxpayer having paid too much in taxes during the past year. Sometimes people have even come to rely upon these refunds for planned yearly spending to catch up on bills, go on vacation, buy necessities, etc. Because of this reliance upon income tax refunds, those looking at filing for bankruptcy are often dismayed to find that the bankruptcy court may seize part or all of their refunds. How might this be avoided? The first thing someone looking to file bankruptcy must understand is the idea of the “bankruptcy estate.” Every asset they have, or have the right to receive, at the time they file their bankruptcy is filed is considered a part of the bankruptcy estate. Every asset, to the extent not considered exempt, is subject to being taken by the bankruptcy trustee to distribute to the debtor’s creditors. Avoiding this taking of assets is one of the goals the person looking to file for bankruptcy, and should be the goal for an experienced bankruptcy attorney. Across the country, consumers are falling prey to a new scam targeting people who have filed for bankruptcy and others just getting started with the process. Bankruptcy attorneys are joining forces with public officials to sound the alarm bell to unsuspecting consumers. The con artists are using software that “spoofs” the Caller ID system so that the call appears to be originating from the phone line of the consumer’s bankruptcy attorney. Victims of the scam are being instructed to immediately wire money to satisfy a debt that supposedly is outside the bankruptcy proceeding. Some consumers have been threatened with arrest if they fail to wire money to pay the debt. In some instances, the perpetrators are using personal information from public filings to identify consumers, assume the identity of their attorneys and sound more convincing by phone. These calls are typically placed during nonbusiness hours, making it difficult for clients to verify the call by getting in touch with their attorney to ask about it. The National Association of Consumer Bankruptcy Attorneys (NACBA) and its individual members want consumers to know that under no circumstance would a bankruptcy attorney or staff member telephone a client and ask for a wire transfer immediately to satisfy a debt. Nor would the bankruptcy attorney and staff ever threaten arrest if a debt isn’t paid. Consumers should be advised that legitimate debt collectors and agencies cannot threaten arrest in order to satisfy. If you or a family member receive this kind of call, the best thing to do is to hang up and contact your bankruptcy attorney as soon as possible. Do NOT give out any personal or financial account information to the caller. It’s morally wrong to file for Bankruptcy? Many people facing bankruptcy feel a strong sense of failure and embarrassment. The banks and even the media would like you to feel it is your fault. The truth is my clients are good people who want to pay their debts but find themselves in a bad situation. Many have found themselves drowning in debt due to no fault of their own. You have a legal right to seek real debt relief under the U. S. Bankruptcy Code. My best advice is to hold off on any moral judgment until you have all the information. If you would like more information on filing for bankruptcy click HERE to visit my website. Why should I file a Preemptive Bankruptcy? • findings of fraud are likely.